How do I become a better presenter? What’s the secret to presenting like Steve Jobs? How do I make sure people keep listening to me? In the run up to UX Camp Brighton, an annual one day ‘un-conference’ I co-organise, I’ve been mentoring new speakers to hone their presenting skills and craft their sessions. The questions the people I’m coaching have asked have made me reflect on what makes a captivating presenter and a memorable presentation. Now you could look in books (I’d certainly recommend Scott Berkun’s ‘Confessions of a Public Speaker’ and Dan Newman’s ‘From the Front of the Room’), you could trawl through talks on Ted.com, analyse keynotes from Steve Jobs, or study the oratory of Barack Obama. All valuable things to do. Alternatively, you could set aside two and a half minutes and learn pretty much all you need to know from Sly & the Family Stone. What you waiting for? Plug in your headphones. Turn up the volume. Press play. You’re about to take a step towards perfecting your skills as a presenter. What a track. It gets better with each listen. As for presenting, here’s eight valuable tips every presenter needs to know and can learn from Sly & the Family Stone. Let’s start with a tip that so sounds obvious, yet one that when ignoring is the cause of garbled, confused and rambling presentations. Know the purpose behind your presentation and stick to delivering on it. Your message might be more involved and less directly instructional than ‘Dance to the music’ but it shouldn’t be any less compelling or any less memorable. When I coach people I get them to start at the end with the few key takeaway message(s) they want to communicate. I then get them to write these down so they don’t lose sight of them. As their presentation emerges the key message should be woven throughout. If what you’re saying or showing doesn’t support your takeaway messages then bin it. Ever been to a presentation where the speaker gives you their life history, recaps their CV, turns to read from the screen, and then apologises for not being prepared? It makes me cringe. Go and re-listen to the first 30 seconds of ‘Dance to the music’. I’ll wait for you to come back. Does it make your ears prick up? There’s no apology there. Just an instruction to listen and a big dose of confidence that you’re in safe hands and in for a good time. Grabbing attention doesn’t mean you have to go in loud as soon as you hit the stage. It doesn’t mean you need to start with a joke. It doesn’t mean you need to give away the ending. But it does mean you need to craft the first minute to give your audience faith that they’ll be rewarded from sticking with you. A friend of mine once wisely said all the best music, whatever the style, is successful because it manages to continually build and release tension. Presentations are the same. The changes of pace create interest and the spaces provide focus. If you become metronomic your audience will stop paying attention. The occasional shift in key or additional surprise riff will keep them hooked. A change in tempo also always you, and more importantly the audience, a chance to breathe. Where designers might use white space and musicians might use rests between notes, the best presenters use pauses and silence to amplify their message. The question I hear a lot from people new to presenting is ‘What if the audience don’t engage with me?’ It’s a natural concern, especially for novice presenters. However, I think its the wrong question to ask. I prefer to change the emphasis to look at your presentation from the audience’s viewpoint and ask ‘How are you going to know if your presentation was a success?’. Your role, in varying proportions is to inform, educate and entertain the audience. Once you know what success looks like you can then start to measure it. In musical terms, success might be to get the audience to shake their funky stuff, or to storm the stage, or to get them to hum the riffs or sing the chorus the next day. It’s easier to know how to engage the audience when you’ve thought about what change you want to help them make or action you want them to take. Would you rather see the tribute act or the real thing? You can’t be like Steve Jobs because you’re not Steve Jobs. But, the good news is only you can be an original of yourself. Find what you’re passionate about and go and talk about it in a style that is unique to you. After all, who knew they wanted to listen to ‘psychedelic soul’? Who even knew what it was until a crazy bunch of pioneering musicians found their own groove and shared it with the world. You set the tone of your presentation. The tone and style you adopt is infectious. This can be good or bad. If you sound bored then you’re giving a big signal for your audience to be bored. If you bring the energy then your audience will feel it too. Think how you’d like the the audience to feel and then present in a style that helps them get in that mood. The good news is, like folks going out to a gig, your audience wants to be entertained. They start on your side so keep them there. There’s a contradiction that if someone makes something look easy then you can be sure they have put in a lot of effort to make it so. Nobody is born a great orator. It might come easier to some than others but all notable presenters work hard to make it look effortless. Sly and the band hit the balance between being tight as a unit with the laid back feel of improvising as they play. There’s no shortcuts here, to sound this fresh and relaxed comes out of practicing hard, making mistakes and trying out alternatives. Take it from Sly, a little presentation jamming in front of the mirror in your private rehearsal space will give you the confidence to nail your performance on the day. Think of your slides as your backing band. Sure they add some colour and visual interest but it’s you that should be in the spotlight. Your slides should give people something to look at but if the attention of your audience is on them then it can’t be on you. Try presenting without a slidedeck. If you need a slidedeck use bold images, very limited text, and as few slides as possible. If need be to keep you in the spotlight grow your afro and dig out your best and biggest flairs. 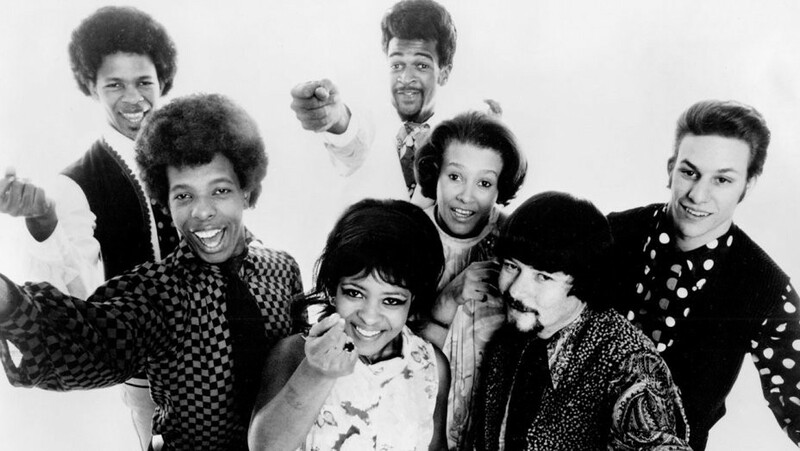 As an up and coming support band on the San Francisco music scene in the mid ’60s Sly & the Family Stone gained a reputation for stealing the show. As a result they rapidly moved up the bill until soon they were the headline act. So, to be the standout slot and the presenter everyone talks about (for good reasons), then give yourself a blast of the funk before you go on stage and help your audience to ‘Dance to the music’.